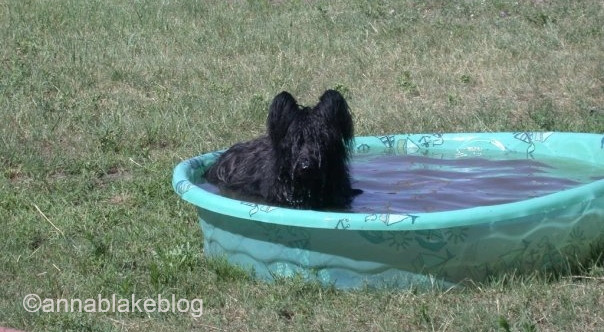 It’s the best container for a hairy black dog in July. This is Tomboy (aka Swamp Thing.) She likes the pond better, but we negotiated this solution because it turns out there’s a reason they don’t make bath salts scented with Pond Scum. ← Donkeys for Peace: Edgar Rice Burro, my Hero. Ahhhhh the beautiful girl…wait isn’t she Swamp Thing2? I think her mom was Swamp Thing1? Yes, it’s a hereditary condition. I will need to negotiate this kind of solution with my dog who prefers the puddle at the barn to all other types of water! Ruby and Boca gave their pool to their Labradoodle cousin and she knew just what to do with it. I fear the corgis would sink like rocks. Even at that depth. I did think pool toys might encourage the un-corgis. Reminds me …… must clean out my pond! Use a briard. Tommi would love to help.